Martin Clarke is unlikely to return to the Down football squad in 2016, his brother John has told BBC Sport. Clarke, 28, ended a successful Australian Rules career in 2014 with Addison's Disease hindering his second spell with the Collingwood club. He played Sigerson Cup for Queen's early in 2016 but has told his brother John that the condition means he will be unable to commit to the Down squad. "The Addison's that he has just won't allow him," said John Clarke. "He did feature for Queen's and he went pretty well but he won't be featuring for Down in the foreseeable future." Addison's Disease is a disorder of the adrenal glands which can lead to flu-like symptoms, but it can be effectively controlled by treatment. Clarke's continuing absence is a major loss for a Down side that look doomed to relegation in Division 1 after three opening defeats. After their opening home hammering by Donegal, a narrow defeat at Monaghan hinted at improvement for Eamonn Burns' squad only for the Mournemen to suffer a chastening 0-22 to 0-6 thumping by Kerry at Pairc Esler on Sunday. "Martin would love to be back but the time and and commitment that's required, I just don't think that he can fully commit to it," added John Clarke, who also previously played for Down. "That's not to say that he will never play for Down again but at the minute, his priorities lie elsewhere." Clarke also doesn't expect Benny Coulter to be available to the Down squad in 2016. Eamonn Burns spoke optimistically in December that Coulter, 33, would rejoin the squad after not being part of previous manager Jim McCorry's panel last year. "Benny was back doing a bit of gym work but at the minute, I can't see Benny playing for Down in 2016," added Clarke. 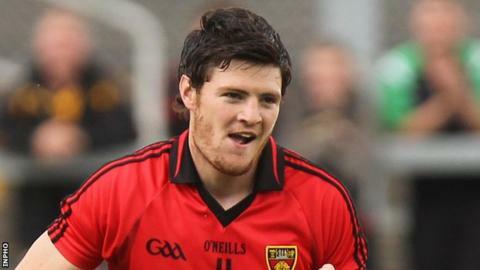 Both Coulter and Martin Clarke helped Down reach the 2010 All-Ireland Final where they were narrowly defeated by Cork.